Canadian lager brand Molson have recently been running a 'Molson Canadian Nation' campaign, but this has become the latest big name social media campaign to run into difficulties. The campaign ran as a Facebook Group under the banner of 'Molson Canadian Nation', but has been cancelled after accusations that it promoted irresponsible drinking. 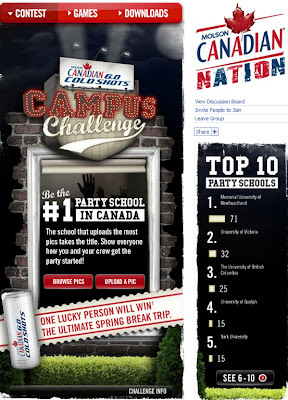 'Canadian Nation' university and college students were encouraged to post pictures of themselves partying on their campus, with the best photo winning an $8000 trip for 5 to Cancun. Various 'university administators' condemned Molson for promoting excess drinking and irresponsible behaviour. People have also pointed out the danger to future career prospects of posting drunken party photos to the internet. The Canadian Nation campaign did not run outside Canada, but has been pulled in the face of the criticism it received. Molson still view social media as an important media channel though and say they will continue to experiment with blogs and user generated content. Nick Burcher writes: "Molson's Canadian Nation Facebook campaign is an good example of how social media campaigns can engage the target audience but upset the wider population. This is a difficult area for brands, but the rewards from getting it right will (in most cases) offset the risks of getting it wrong."